Gary Christie, Trading Central’s Technical Analyst responsible for futures market coverage, will be presenting Trading Central’s views on potential short-term technical setups in Commodities, Index and Currency Futures Markets. Register now to join him, and learn how you can better position your trades to take advantage of these market moves. A question and answer session will follow this live, online presentation, so you can raise you own questions on the futures markets. level of quality research, advanced tools and profesional service. sign-up for a free 30-day trial. 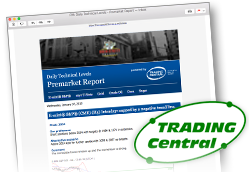 Try a two-week sample of trading central reports with main street trading service. This site has been published in the United States for residents of the United States. Nothing here is an offer or solicitation for the purchase and sale of commodity futures and options contracts, or any products or services to persons, other than U.S. residents. Futures and Options trading involves a substantial risk of loss and is not suitable for all investors. Please carefully consider your financial condition prior to making any investments. Market Data provided by Barchart. Copyright © 2019. All market data is provided by Barchart Market Data Solutions.